Download "STAGE 2 MEANINGFUL USE FOR ELIGIBLE HOSPITALS AND CRITICAL ACCESS HOSPITALS (CAHS)"
1 STAGE 2 MEANINGFUL USE FOR ELIGIBLE HOSPITALS AND CRITICAL ACCESS HOSPITALS (CAHS) CORE MEASURES must meet all CPOE for Medication, Laboratory and Radiology Orders Objective: Use computerized provider order entry (CPOE) for medication, laboratory, and radiology orders directly entered by any licensed healthcare professional who can enter orders into the medical record per state, local, and professional guidelines. Measure: More than 60 percent of medication, 30 percent of laboratory, and 30 percent of radiology orders created by authorized providers of the eligible hospital s or CAH s inpatient or emergency department (POS 21 or 23) during the EHR reporting period are recorded using CPOE. Exclusion: N/A Record Demographics Objective: Record all of the following demographics: preferred language, gender, race, ethnicity, date of birth, date and preliminary cause of death in the event of mortality in the eligible hospital or CAH. Measure: More than 80 percent of all unique patients admitted to the eligible hospital s or CAH s inpatient or emergency department (POS 21 or 23) during the EHR reporting period have demographics recorded as structured data. Record Vital Signs Objective: Record and chart changes in the following vital signs: height/length and weight (no age limit); blood pressure (ages 3 and over); calculate and display body mass index (BMI); and plot and display growth charts for patients 0-20 years, including BMI. Measure: More than 80 percent of all unique patients admitted to the eligible hospital s or CAH s inpatient or emergency department (POS 21 or 23) during the EHR reporting period have blood pressure (for patients age 3 and over only) and/or height/length and weight (for all ages) recorded as structured data. Record Smoking Status Objective: Record smoking status for patients 13 years old or older. Measure: More than 80 percent of all unique patients 13 years old or older admitted to the eligible hospital s or CAH s inpatient or emergency departments (POS 21 or 23) during the EHR reporting period have smoking status recorded as structured data. Exclusion: Any eligible hospital or CAH that neither sees nor admits any patients 13 years old or older. 2 Clinical Decision Support Interventions Objective: Use clinical decision support to improve performance on high-priority health conditions. Measure 1: Implement five clinical decision support interventions related to four or more clinical quality measures at a relevant point in patient care for the entire EHR reporting period. Absent four clinical quality measures related to an eligible hospital or CAH s patient population, the clinical decision support interventions must be related to high-priority health conditions. It is suggested that one of the five clinical decision support interventions be related to improving healthcare efficiency. Measure 2: The eligible hospital or CAH has enabled the functionality for drug-drug and drug-allergy interaction checks for the entire EHR reporting period. Patient Electronic Access to Information Objective: Provide patients the ability to view online, download, and transmit information about a hospital admission. Measure 1: More than 50 percent of all unique patients discharged from the inpatient or emergency departments of the eligible hospital or CAH (POS 21 or 23) during the EHR reporting period have their information available online within 36 hours of discharge. 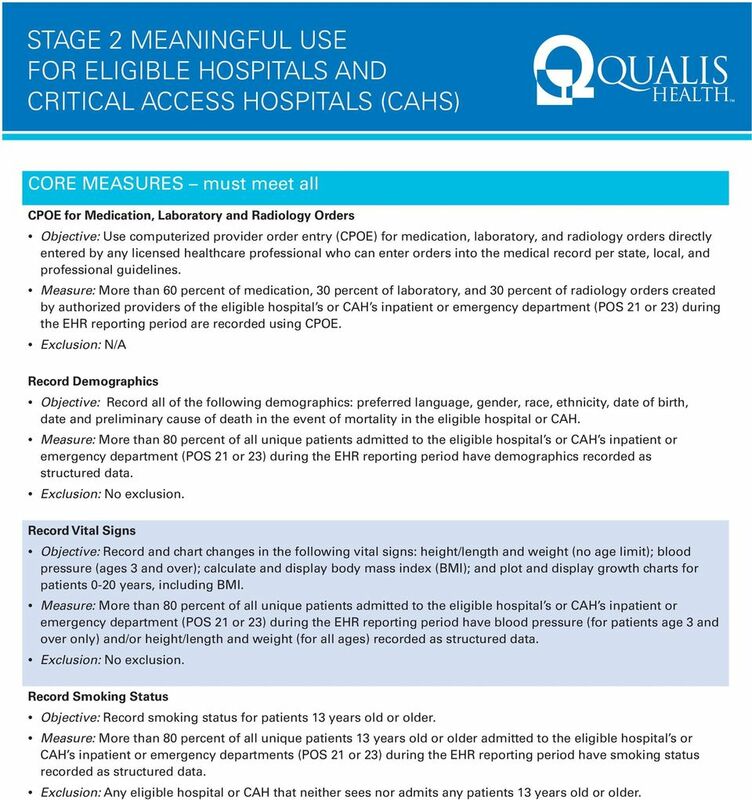 Measure 2: More than 5 percent of all unique patients (or their authorized representatives) who are discharged from the inpatient or emergency department (POS 21 or 23) of an eligible hospital or CAH view, download or transmit to a third party their information during the EHR reporting period. Exclusion: Any eligible hospital or CAH that is located in a county that does not have 50 percent or more of its housing units with 3Mbps broadband availability according to the latest information available from the FCC on the first day of the EHR reporting period is excluded from the second measure. Protect Electronic Health Information Objective: Protect electronic health information created or maintained by the Certified EHR Technology through the implementation of appropriate technical capabilities. Measure: Conduct or review a security risk analysis in accordance with the requirements under 45 CFR (a)(1), including addressing the encryption/security of data stored in CEHRT in accordance with requirements under 45 CFR (a)(2)(iv) and 45 CFR (d)(3), and implement security updates as necessary and correct identified security deficiencies as part of the risk management process for eligible hospitals and CAHs. 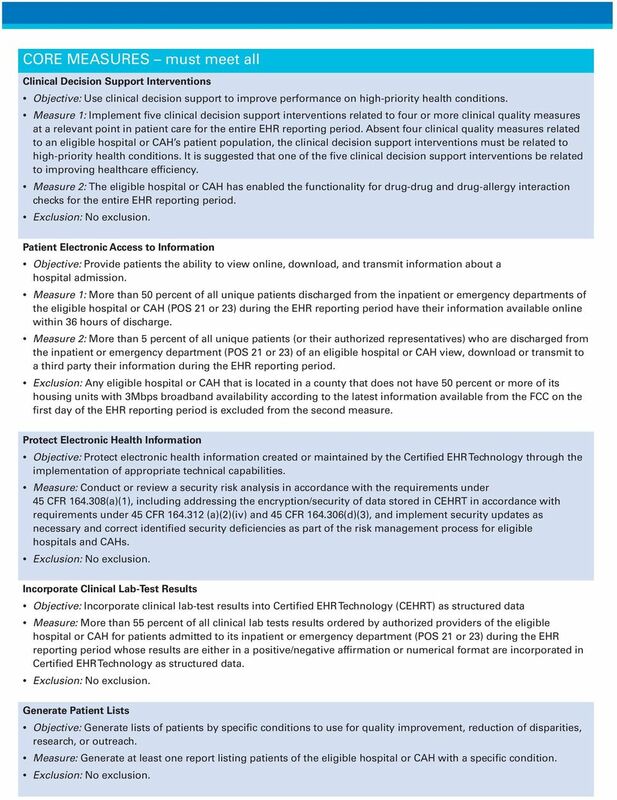 Incorporate Clinical Lab-Test Results Objective: Incorporate clinical lab-test results into Certified EHR Technology (CEHRT) as structured data Measure: More than 55 percent of all clinical lab tests results ordered by authorized providers of the eligible hospital or CAH for patients admitted to its inpatient or emergency department (POS 21 or 23) during the EHR reporting period whose results are either in a positive/negative affirmation or numerical format are incorporated in Certified EHR Technology as structured data. Generate Patient Lists Objective: Generate lists of patients by specific conditions to use for quality improvement, reduction of disparities, research, or outreach. Measure: Generate at least one report listing patients of the eligible hospital or CAH with a specific condition. 3 Identify Patient-Specific Education Resources Objective: Use clinically relevant information from Certified EHR Technology to identify patient-specific education resources and provide those resources to the patient. 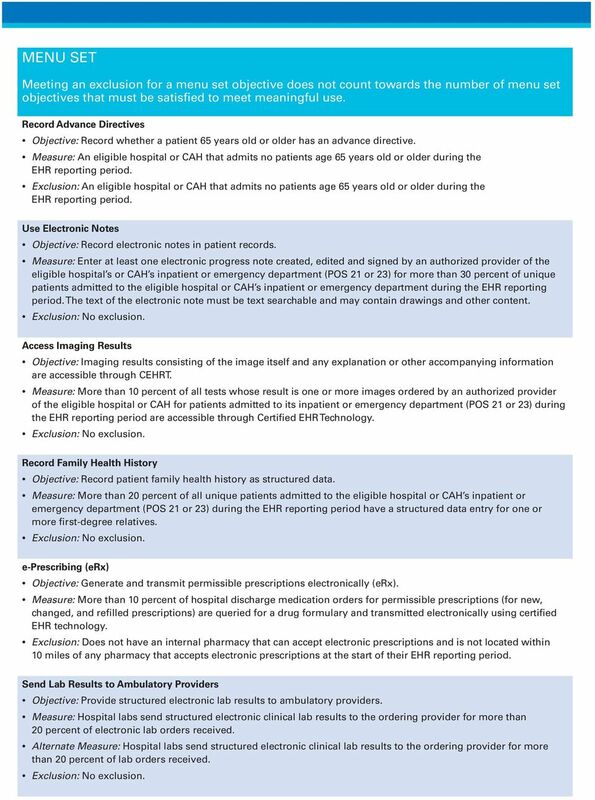 Measure: More than 10 percent of all unique patients admitted to the eligible hospital s or CAH s inpatient or emergency departments (POS 21 or 23) are provided patient-specific education resources identified by Certified EHR Technology. Perform Medication Reconciliation Objective: The eligible hospital or CAH who receives a patient from another setting of care or provider of care or believes an encounter is relevant should perform medication reconciliation. Measure: The eligible hospital or CAH performs medication reconciliation for more than 50 percent of transitions of care in which the patient is transitioned into the care of the EP or admitted to the eligible hospital s or CAH s inpatient or emergency department (POS 21 or 23). Provide Summary of Care Record Objective: The eligible hospital or CAH who transitions their patient to another setting of care or provider of care or refers their patient to another provider of care provides a summary care record for each transition of care or referral. Measure 1: The eligible hospital or CAH that ransitions or refers their patient to another setting of care or provider of care provides a summary of care record for more than 50 percent of transitions of care and referrals. Measure 2: The eligible hospital or CAH that transitions or refers their patient to another setting of care or provider of care provides a summary of care record for more than 10 percent of such transitions and referrals either (a) electronically transmitted using CEHRT to a recipient or (b) where the recipient receives the summary of care record via exchange facilitated by an organization that is an ehealth Exchange (used to be NwHIN Exchange) participant or in a manner that is consistent with the governance mechanism ONC establishes for the nationwide health information network. 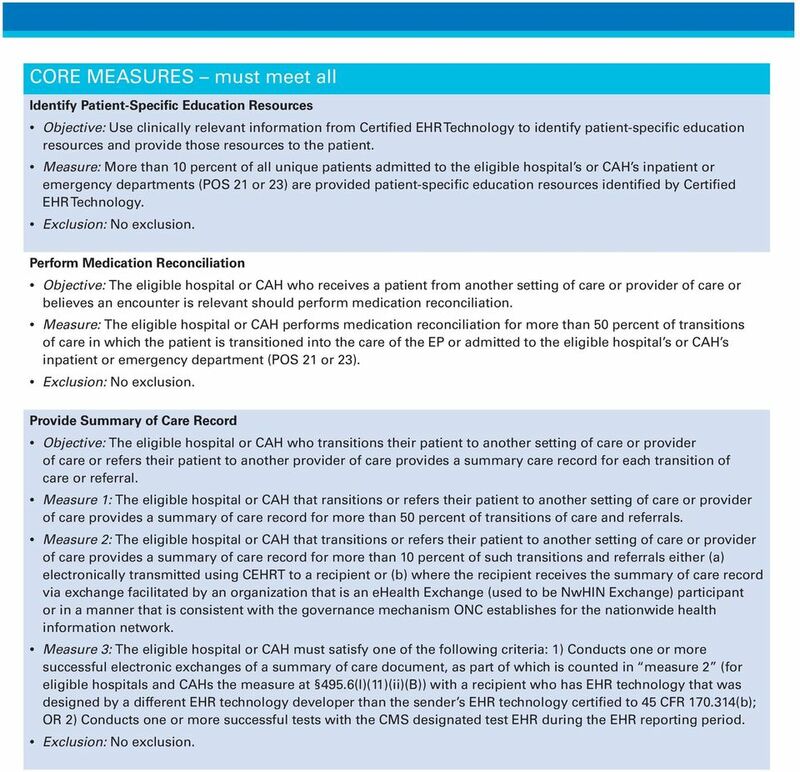 Measure 3: The eligible hospital or CAH must satisfy one of the following criteria: 1) Conducts one or more successful electronic exchanges of a summary of care document, as part of which is counted in measure 2 (for eligible hospitals and CAHs the measure at 495.6(l)(11)(ii)(B)) with a recipient who has EHR technology that was designed by a different EHR technology developer than the sender s EHR technology certified to 45 CFR (b); OR 2) Conducts one or more successful tests with the CMS designated test EHR during the EHR reporting period. 4 Submit Data to Immunization Registries Objective: Capability to submit electronic data to immunization registries or immunization information systems except where prohibited, and in accordance with applicable law and practice. 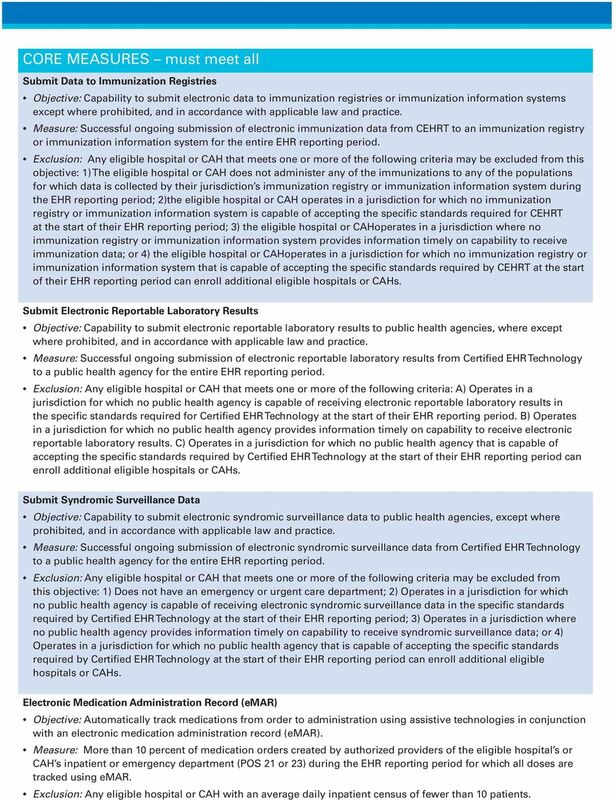 Measure: Successful ongoing submission of electronic immunization data from CEHRT to an immunization registry or immunization information system for the entire EHR reporting period. Exclusion: Any eligible hospital or CAH that meets one or more of the following criteria may be excluded from this objective: 1) The eligible hospital or CAH does not administer any of the immunizations to any of the populations for which data is collected by their jurisdiction s immunization registry or immunization information system during the EHR reporting period; 2)the eligible hospital or CAH operates in a jurisdiction for which no immunization registry or immunization information system is capable of accepting the specific standards required for CEHRT at the start of their EHR reporting period; 3) the eligible hospital or CAHoperates in a jurisdiction where no immunization registry or immunization information system provides information timely on capability to receive immunization data; or 4) the eligible hospital or CAHoperates in a jurisdiction for which no immunization registry or immunization information system that is capable of accepting the specific standards required by CEHRT at the start of their EHR reporting period can enroll additional eligible hospitals or CAHs. Submit Electronic Reportable Laboratory Results Objective: Capability to submit electronic reportable laboratory results to public health agencies, where except where prohibited, and in accordance with applicable law and practice. Measure: Successful ongoing submission of electronic reportable laboratory results from Certified EHR Technology to a public health agency for the entire EHR reporting period. Exclusion: Any eligible hospital or CAH that meets one or more of the following criteria: A) Operates in a jurisdiction for which no public health agency is capable of receiving electronic reportable laboratory results in the specific standards required for Certified EHR Technology at the start of their EHR reporting period. B) Operates in a jurisdiction for which no public health agency provides information timely on capability to receive electronic reportable laboratory results. C) Operates in a jurisdiction for which no public health agency that is capable of accepting the specific standards required by Certified EHR Technology at the start of their EHR reporting period can enroll additional eligible hospitals or CAHs. Submit Syndromic Surveillance Data Objective: Capability to submit electronic syndromic surveillance data to public health agencies, except where prohibited, and in accordance with applicable law and practice. Measure: Successful ongoing submission of electronic syndromic surveillance data from Certified EHR Technology to a public health agency for the entire EHR reporting period. Exclusion: Any eligible hospital or CAH that meets one or more of the following criteria may be excluded from this objective: 1) Does not have an emergency or urgent care department; 2) Operates in a jurisdiction for which no public health agency is capable of receiving electronic syndromic surveillance data in the specific standards required by Certified EHR Technology at the start of their EHR reporting period; 3) Operates in a jurisdiction where no public health agency provides information timely on capability to receive syndromic surveillance data; or 4) Operates in a jurisdiction for which no public health agency that is capable of accepting the specific standards required by Certified EHR Technology at the start of their EHR reporting period can enroll additional eligible hospitals or CAHs. Electronic Medication Administration Record (emar) Objective: Automatically track medications from order to administration using assistive technologies in conjunction with an electronic medication administration record (emar). Measure: More than 10 percent of medication orders created by authorized providers of the eligible hospital s or CAH s inpatient or emergency department (POS 21 or 23) during the EHR reporting period for which all doses are tracked using emar. Exclusion: Any eligible hospital or CAH with an average daily inpatient census of fewer than 10 patients. 5 MENU SET Meeting an exclusion for a menu set objective does not count towards the number of menu set objectives that must be satisfied to meet meaningful use. Record Advance Directives Objective: Record whether a patient 65 years old or older has an advance directive. Measure: An eligible hospital or CAH that admits no patients age 65 years old or older during the EHR reporting period. Exclusion: An eligible hospital or CAH that admits no patients age 65 years old or older during the EHR reporting period. Use Electronic Notes Objective: Record electronic notes in patient records. Measure: Enter at least one electronic progress note created, edited and signed by an authorized provider of the eligible hospital s or CAH s inpatient or emergency department (POS 21 or 23) for more than 30 percent of unique patients admitted to the eligible hospital or CAH s inpatient or emergency department during the EHR reporting period. The text of the electronic note must be text searchable and may contain drawings and other content. Access Imaging Results Objective: Imaging results consisting of the image itself and any explanation or other accompanying information are accessible through CEHRT. Measure: More than 10 percent of all tests whose result is one or more images ordered by an authorized provider of the eligible hospital or CAH for patients admitted to its inpatient or emergency department (POS 21 or 23) during the EHR reporting period are accessible through Certified EHR Technology. Record Family Health History Objective: Record patient family health history as structured data. Measure: More than 20 percent of all unique patients admitted to the eligible hospital or CAH s inpatient or emergency department (POS 21 or 23) during the EHR reporting period have a structured data entry for one or more first-degree relatives. e-prescribing (erx) Objective: Generate and transmit permissible prescriptions electronically (erx). Measure: More than 10 percent of hospital discharge medication orders for permissible prescriptions (for new, changed, and refilled prescriptions) are queried for a drug formulary and transmitted electronically using certified EHR technology. Exclusion: Does not have an internal pharmacy that can accept electronic prescriptions and is not located within 10 miles of any pharmacy that accepts electronic prescriptions at the start of their EHR reporting period. Send Lab Results to Ambulatory Providers Objective: Provide structured electronic lab results to ambulatory providers. Measure: Hospital labs send structured electronic clinical lab results to the ordering provider for more than 20 percent of electronic lab orders received. Alternate Measure: Hospital labs send structured electronic clinical lab results to the ordering provider for more than 20 percent of lab orders received.